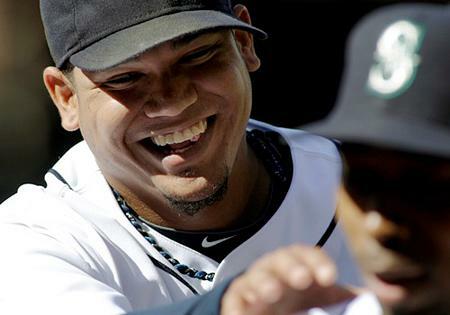 Felix Hernandez, seen here with teammate Chone Figgins in September, has been named the American League's Cy Young Award winner for 2010. 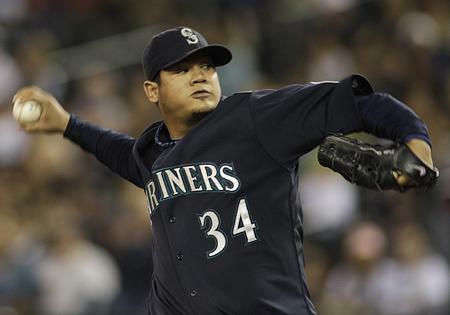 Mariners pitching ace Felix Hernandez has won the American League Cy Young Award despite his 13-12 record. Art said in a recent commentary that Hernandez deserved the award, despite his low win total. Among American League starters, Hernandez ranked first in earned run average (ERA), innings pitched, strikeouts, quality starts, and opponents’ batting average. He was tied for first in starts and third in complete games. Hernandez edged the New York Yankees' CC Sabathia and the Tampa Bay Rays' David Price for the award. While it’s his first Cy Young, it’s the second for the Mariners organization. Randy Johnson won it in 1995.